Booklet included: No. As with many Lo Scarabeo decks, this deck includes 9 extra cards, with instructions in Italian, French, German, Spanish & English. These instructions are generic, they pay no attention to the actual deck itself (see note below). In this deck we have taken the Major Arcana card No. 1, Panfilio, and shown that in place of the usual Magician. 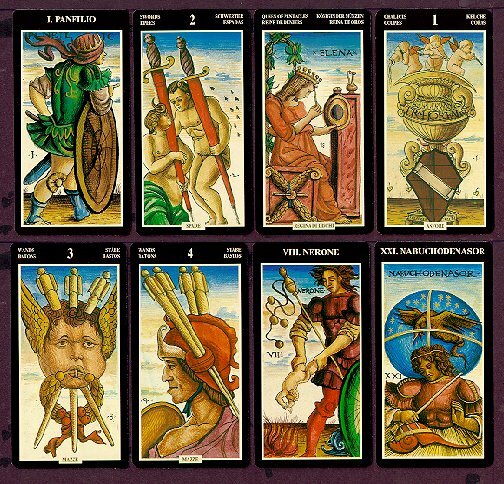 The other Major Arcana shown above, No. 21, is titled Nabuchodenasor. The instructions packed with this deck pay no attention to the uniqueness of the Majors. Card number 8, for example, is described as "wisdom, meditation, loneliness, prudence". The figure on the card is titled, "Nerone", eg, Nero, and shows a man casting a small baby into a fire.